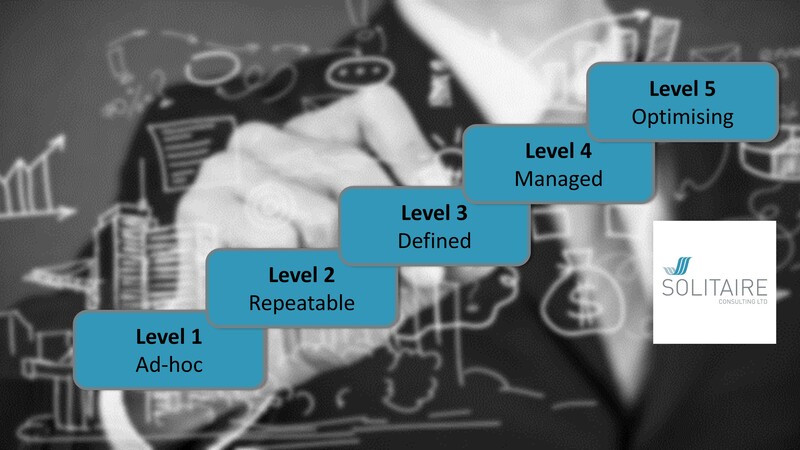 BPM – where is your organisation on the process maturity journey? Business process management (BPM) is a systematic approach to making an organisation’s processes and workflows more effective, more efficient and more flexible in a changing business environment. Processes are at the heart of all business activities and ensure that consistency and repeatability can be achieved. Achieving processes excellence improves the way that businesses create and deliver value to customers. The important point here is that processes serve the customer rather than the organisation itself. The goal of BPM is to reduce human error, process variation and wastage and focus stakeholders on the requirements of their function or role. Many organisations make the mistake of investing in technology solutions to automate processes and workflows before they really understand the processes themselves. The process understanding must come before the technology, otherwise there is always a risk of just automating the inefficiencies of a manual process. The concept of a maturity model can be helpful in identifying where your organisation is on its process management journey and the optimum support or solution required. The model below has been adapted from the Capability Maturity Model (CMM) originally developed for use in software engineering. There are many methods and systems available to consultants and management to improve all aspects of the business process to achieve greater efficiency and leaner cost values. My view is that the methods applied must be appropriate to your culture and management style, and ideally should be designed specifically for your business. Knowing where you are on the Process Maturity Model will help to guide your thinking on your process management journey and help to identify what your priority areas are. As technology extends to all areas of the business, automation is no longer enough to differentiate yourself from your competitors. Companies that adopt Business Process Management will increasingly be able to adapt quicker to new opportunities and ensure resources and staff are utilised to the best of their ability. If you are interested in discovering what level of the maturity your business is operating at then please contact us to arrange a free discussion. If you found this post useful or interesting, you might like to subscribe to my regular updates using the form on the right hand side of the page. A mention on your favourite social media site would also be appreciated. Thank you. Do you know if the maturity model is in the public domain? I want to put something similar on my web site but I don’t know whose permission to ask if anybody’s. I know you’ve adapted it from CMMI. But I also know that I’ve seen graphics like yours in other places. Can you advise? Thanks. I haven’t been able to establish this directly which is why I have made reference to CMMI in the article. There are a lot of similar maturity models available all based on a five level hierarchy and I certainly would not claim to have discovered anything here, but I do find it a useful tool in my process improvement work. Fair enough. I have another similar version with different wording that I might use. I don’t have the sense that anybody really cares. Is the specific graphic yours? If so, can I get permission to use it, say, with different words? I understand totally if not. thanks. Yes, the graphic is mine and I’ll happily send you a copy. I’ll contact you direct by email. Fantastic. If by chance you give me permission to use it, I’ll certainly credit you. Thanks. I am currently writing my Graduation Assignment which is partically about BPM. Could I be allowed to get a copy of your Business Process Maturity Model? I think it is very interesting and useful, and I have not been able to find a similar version, which is just as describing as this one. Thank you for your feedback on my BPMM. I will gladly provide you with a copy of the model for use in your assignment. Please send an email to info@solitaireconsulting.com and I will reply.